This book was first published by the AHMEDABAD MANAGEMENT ASSOCIATION in 1994, through the Prarthna-AMA Centre for Career Counselling and Vocational Guidance, Torrent-AMA Management Centre, Opp Punjabi Hall, Navrangpura, Ahmedabad 380 009. In 1998 the book was completely revised and updated by the author, and published under the same title by St Paul Publications, Bombay, in the category of BETTER YOURSELF BOOKS. The information below pertains to the latter book. The books are presently out of print. This book is addressed to you, young men and women. There comes a stage in your life when you have to face an Interview Board, and you get the jitters. You feel it is a new ordeal and you are ill-prepared for it. Fact is, you have been facing interview boards from the time of your Kindergarten admission! True, a job interview has a different dynamic altogether. But remember that it is not an entirely new experience. Your need for sound advice and relevant guidance is justified, nevertheless. This book will come in very handy. The book provides practical ways for exploring the job market and making contact with prospective employers through such requirements as the curriculum vitae (or ‘bio-data’), application forms, and business correspondence. It highlights the background and suggests ways of preparing for job-interviews. Further, it tackles the nitty-gritty of job-interviews, offering a comprehensive range of instructions and skills. 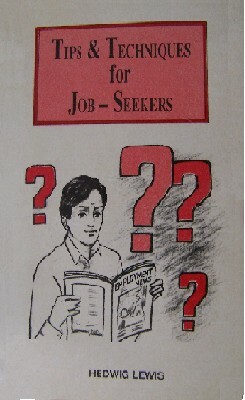 The ordinary job-seeker will find the tips and techniques in the following pages extremely useful and practical. Career Counsellors and Job Consultants will find this an effective handbook for their clients. Interviewers can build up a fairly accurate picture of you by comparing information from different sources. It is therefore important to be aware of the several factors that contribute to creating your complete image, as listed below, rather than concentrate on individual aspects of your performance. Your appearance (how you present yourself physically). Your responses to questions (what you say). Your thought-patterns (how you structure your answers). Your manner of talking (how you express yourself). Your body movements, posture and facial expressions. Your reactions to what the interviewer says and does. Your general attitude and manner. Your ability to ask relevant questions. Could you say something about yourself? How do you think your education has equipped you for this job? Are there any particular skills you have that qualify you for the job? What are your greatest strengths? What are your weaknesses? What are your short and long-term career goals? Where do you see yourself in five years? Do you usually like to work with others or by yourself? Like consumerism, the job-market is a highly competitive phenomenon. 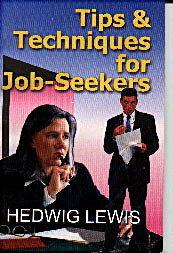 It requires a great deal of preparedness, attention to detail, sincerity of purpose and above all, a lot of confidence on the part of the job seeker.... With a view to helping such job aspirants, Fr Hedwig Lewis, SJ has written this book which covers the entire procedure from preliminaries to preparing a Curriculum Vitae (CV) to drafting the application/covering letters. The book also explains the job selection process in detail to enable the candidates prepare themselves for the subsequent interview. The author further elaborates on the current and post-interview scenario taking the reader to perfection at the time of interview as well as after the interview. 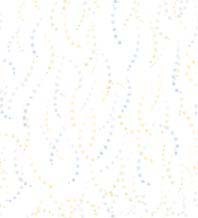 This book also offers a number of specimen formats for letters, application, and sending documents. In short, the book represents a perfect guide for the job seekers who are looking for outright success in job selection.